Cats love to nap. In fact, they spend 13-18 hours of every day snoozing! If you want to convince your cat to give up that cosy piece of furniture she’s commandeered, you’re going to need a bed for your kitty which ticks all of her boxes. Luckily zooplus has quality cat beds starting from as little as £4.99 so you won’t need to raid the other ‘kitty’ to pay for it! Cats are particular about where they choose to rest their pretty heads and fabric choice is important to them. 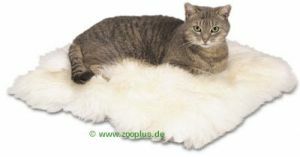 Fleece, faux-fur, velour and other plush materials are all very popular and will give your cat something to bury her paws in to. Don’t choose anything too loosely woven as your cat will inevitably get her claws caught and rip a hole in the bed, or worse, injure herself in the process. Our Sheepskin Pet Cushion is the ultimate in luxurious pampering – your kitty will feel like she’s sinking into cotton wool clouds! For an equally sumptious nest style bed have a look at our Plush Cat Bed Leika, with thick padded sides to give a cuddly cat the feeling of security and keep out the winter draughts. 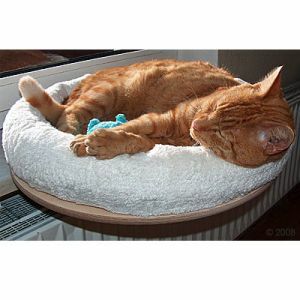 For sheer contentment all year round we suggest our Cuddly Cat Bed which has cooler summer fabric on one side but when autumn comes, this can be reversed and transformed into a super soft and fleecy nest bed for your cat. Walk down any street and you’re sure to see lots of cats sitting on window sills, watching the world go by. This favourite spot is not always the comfiest but we have the answer – Cat Windowsill Mats! These mats also protect your paintwork from claw scratches and fur. If your window ledge isn’t wide enough for a mat (or indeed, a cat) then that’s not a problem, you just need one of our Windowsill Snugly Cat Beds. 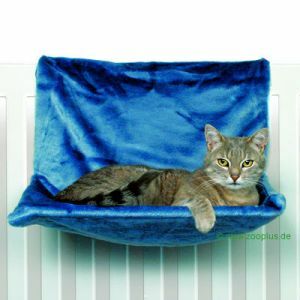 These clever beds can be clamped onto narrow window ledges, giving your cat a snuggly raised nest complete with a fabulous view! If you’ve ever seen your cat inching herself sideways to keep up with a sun beam you’ll know how much cats love a warm spot! In the winter, a bed hung next to the heater will be the epitomy of comfort for your kitty. Our Cat Radiator Beds all come with the plushest of fabrics and are designed to hold the weight of even the heavier breeds. The main consideration with these beds is your cat’s age and mobility levels as they require your cat to jump in. If your cat does not immediately take to her new bed then don’t despair – there are lots of things you can do to help bring her round. You could place a cat nip toy in the bed or even spray it with some Feliway cat pheromone so she starts to perceive it as safe and familiar. It might also help to raise the bed from the floor onto a higher surface if you think she is feeling too exposed. To make it extra inviting, place a SnuggleSafe Heat Pad inside the bed or add some extra blankets and pillows so she can truly wallow in comfort. 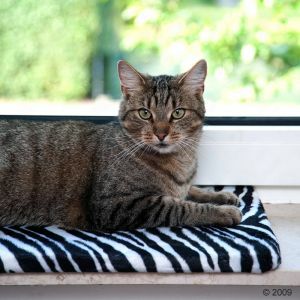 Our Cat Blankets can also be used to protect furniture from hair and scratches. Thicker blankets like our Atonga Blanket will also help protect you and your clothes from kneading claws! If all else fails, forbidding your cat to go near the bed is usually a good bet! 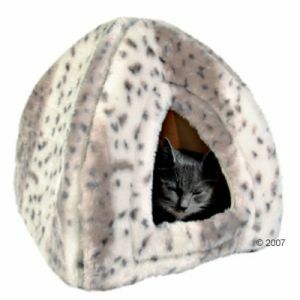 A cat den is the perfect option for a nervous kitty or one who lives in a very busy household. It can act as a lovely warm and cosy bed but also as a quiet retreat where no one can creep up on her unawares. Giving your cat her very own mini ‘lion’s den’ is a great way for her to express nesting instincts. Cuddle Den Leila is a plush little cave in subtle animal prints – a perfect hang out for your little tigress! … or even a castle! If your kitty doesn’t already have a cat tree, then how about buying her one which has a cosy bed already built in on one of the climbing levels? Our plush Cat Tree La Digue is perfect for a multi-cat household. It has two comfy levels for sleeping on, a cosy den and a hammock. If this doesn’t get the cat off your bed then nothing will! 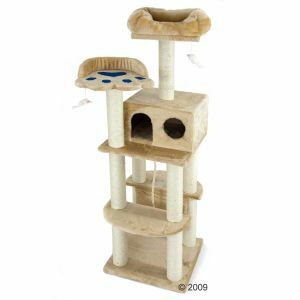 Cat Tree La Digue Now: £69.99 – 50% Off! This entry was posted in Cats by emmas. Bookmark the permalink. Hi, This is a day for me to do blog walk. And as i bumped into your site, i enjoyed reading your article. I think you really have a good quality of articles written here. It is also important for you to realize that your pet will take some time to be well known to you and your family, so if your dog is new to your family members, he may show some traits of worry but all this vanishes with time.